Jrue Holiday is a good player and a tough competitor, but burdened with the ultimate green light he struggled mightily. As a number one option a lot of his shots looked forced tonight, and it showed in the stat sheet and on the scoreboard: 7/23 shooting and a loss by 14. He got it going late, and it is encouraging to see him shoot at least decently from three (3/8), as the deep ball has been an uncharacteristic thorn in his side all season. Holiday’s night was similar to the rest of the guards. Toney Douglas and Tim Frazier, while hard nose, competitive players, just didn’t have it tonight, going a combined 7/26. The front court didn’t fair much better. Omer Asik put up a decent stat line (8 & 9 in 21 minutes) but couldn’t contain Stoudemire or Whiteside (though he did a better job than Perkins, who played most of the 4th). The Heat duo shot a ridiculous 16/19 and grabbed 23 rebounds (10 offensive). Only one man had it going tonight for the home team, Luke Babbitt, who broke out for his best performance in a long time. Babbitt was basically Ryan Anderson when he’s hitting his shots. Well almost. It was not quite a career night for him, but close, scoring 23 on 10/19 shooting (his career high is 24). I just wish he could have gone for 30, he scored 0 in the final frame. Would have been a sight to see. 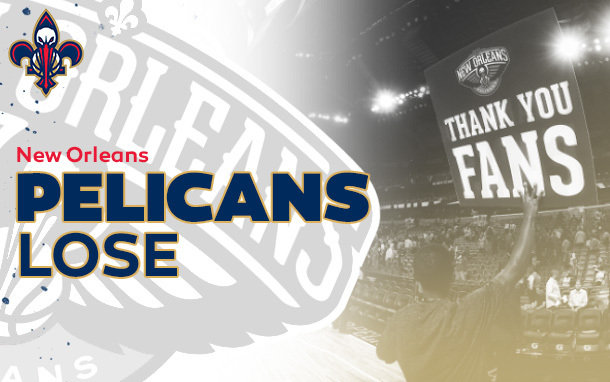 There just aren’t enough NBA bodies available to the Pelicans to be a competitive team night in and night out, that is the reality of these final games. They were able to cut into Miami’s lead at times, getting it down into single digits halfway through the 4th with a 13-0 run. But they couldn’t pull it close enough to make a run f0r the lead themselves. It looks more and more likely the Pels won’t finish any lower than 6th from the bottom (where they currently sit) in the league, but Sacramento, Denver, New York, and Orlando all sit just within a couple game of New Orleans, so every loss (like tonight) helps solidify draft odds. The Heat were led by Wade, Dragic, Stoudemire, and Whiteside, who all scored around 2o points. As a team they shot 50% while the Pels managed just under 40%. The depth of the Heat was a big factor, as you can guess considering the Pels depth is starting now. Miami has been averaging about 114 ppg this month, and tonight they got 113, so I would say it was a comfortable game for them, even though the Pels made it interesting in the final minutes. Next up for the New Orleans is the 37-33 Indiana Pacers in Indiana, Thursday Night, tip off is for 7/6CT. Tune in and Flock Up.